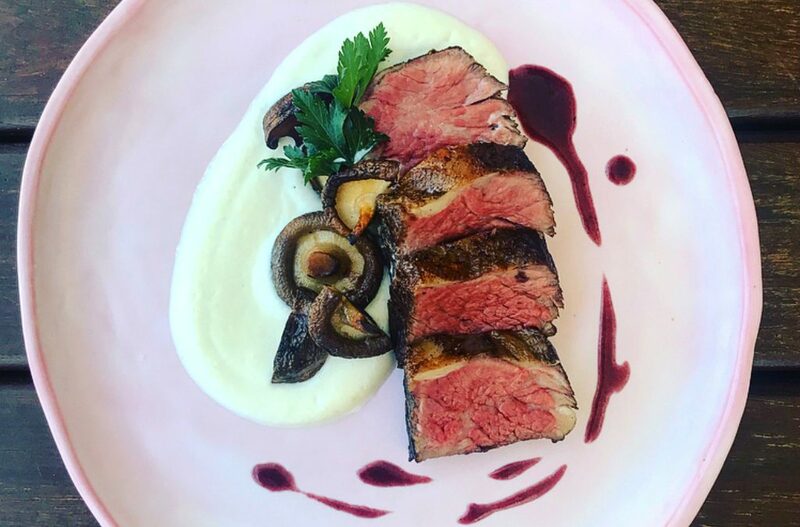 This recipe for 24-hour Sous Vide Beef Short Ribs is accompanied by delicious truffle cauliflower purée, shiitake mushrooms and spiced raspberry jus. Use the recipe for the sides below or come up with your own. Oil and season ribs. Sear on high heat until golden brown, approximately 5 mins. Allow to cool slightly and place in vac pack bag and add butter, garlic and herbs. Vac pack the ribs and set aside. Set your sous vide machine to 55°C for a 24-hour cook and place bagged ribs in a water bath. Cover the bath with a lid or cling wrap to stop water evaporating. If using straight away, remove from the bag and remove the bone by slicing down the rib with sharp knife. Pat dry and sear on high heat for 30 seconds each side. Leave to rest for 3-5 minutes and slice into strips. See the tips if you’re not using immediately. This can be made in advance and heated in a saucepan before serving. Place cauliflower, butter and onion into a sauce pan. Cover with a lid and cook on a low heat until cauliflower is tender, approximately 8-10 minutes. Place the cauliflower mixture in the food processor along with half of the milk and blend adding more milk as necessary until you have a thick but smooth purée. Taste and season accordingly. Add truffle oil if using and blend for a minute to incorporate. Add all ingredients except seasoning, butter and flour into saucepan and simmer on a low to medium heat until sauce has reduced to 1/3. Taste and adjust seasoning with salt, pepper (and sugar if necessary). Strain sauce through a sieve into a clean saucepan. Make a roux using softened butter and flour. On a low heat, whisk roux in to sauce to thicken it. Clean and cut the mushrooms in half. On a high heat, add oil to a sauce pan and cook the mushrooms for 2-3 minutes. Add a knob of butter, toss mushrooms in this and remove from heat. Place a large spoon of purée to the left of the centre of the plate. Run the back of a tablespoon through purée in a circular motion. Slice the meat and place to the side of the purée. Place mushrooms next to the meat and drizzle a little sauce around the plate. If you’re not using the ribs straight away, submerge in ice cold water for 30 minutes. At this point they can be stored in the fridge for up to four days or frozen. To bring the ribs back up to temperature, reheat in sous vide at 55°C for 30 minutes or in the oven at 110°C until internal temp is 55°C, approximately 20-30 minutes. To make the short ribs a softer, pull-apart texture, cook at 80-85°C for 24-hours.